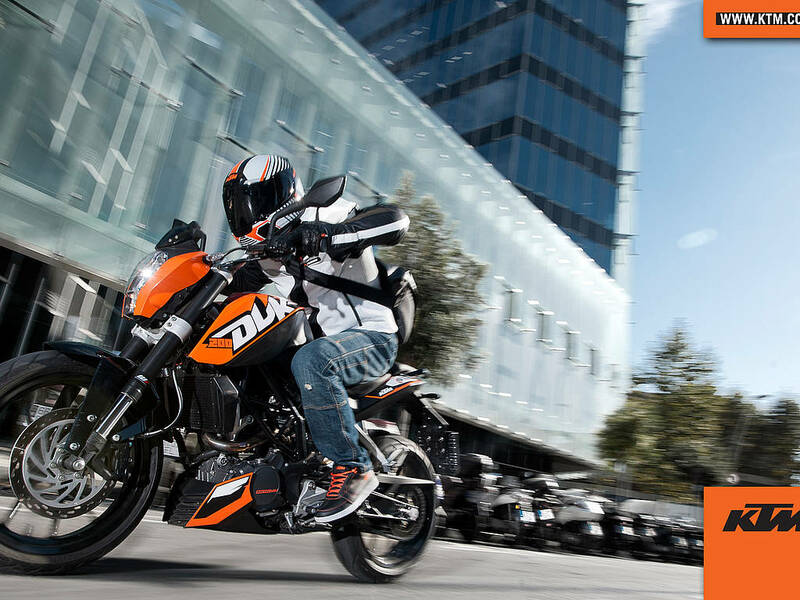 On 24th January, 2012, Bajaj and KTM finally launched the much awaited KTM Duke 200 at a delicious introductory price of Rs. 1.17 lacs ex-showroom Delhi. Everyone on is happy, everyone is excited and many of us is in comparison mode, comparing the KTM Duke 200, with it's nearest rivals, the Yamaha R15 (because of the price and weight proximity of both the bikes) and the Honda CBR 250R (because of the performance proximity of both the bikes). But comparison one side, my Dad asked me as to what kind of a bike is the KTM Duke 200 and what to expect from it. Just a little pause made me realise that it's a very valid question, because I can totally understand and appreciate what does all the technical details mean, does not mean that everyone who comes across that bike, relate to the specs. So, what follows is an attempt to bring out simple meaning of the numbers. The KTM Duke 200 falls under the Naked Street Fighter category, where in a bike tries to exude the beauty of it's creation by avoiding the lust of fairing or semi-fairing. The engine is exposed, i.e., not covered by any fairing bit, parts of the frame is also exposed to add character and above all, the seating is relaxed rather than being aggressive and track focused. The primary objective behind the design is to showcase the beauty of the motorcycles, the engine and other design bits in totality and not hiding them behind aero-dynamic fairing. The primary hunting ground for a Street Fighter Naked machine is the street and therefore the entire engineering of the bike is done to focus on street riding and the KTM Duke 200 follows the rule by the book. One of the most basic characteristic of a Naked Street Fighter motorcycle is it's frame and suspension. A motorcycle meant for the street has a very different frame, suspension and riding geometry than the ones make for sports (track, off-road, motor-cross and the sorts). The KTM Duke 200 has a Steel Trellis frame. So, what's exactly a Trellis frame and how does it add on to the characteristics of the Duke 200? 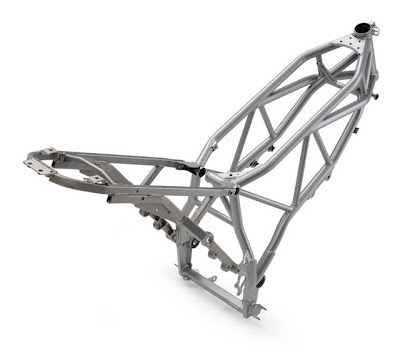 Well, a trellis frame is a motorcycle frame architecture aimed at providing high rigidity, lower weight but above all connecting the steering head and the swing arm as directly as possible. Conceptually a trellis frame works similarily like a full fleged perimeter frame, but achieves the benefits at a much lower cost. Instead of single continous material like the permiter frame, the trellis frame is made up of numerous short steel or alluminium pipes, welded together to form a trellis structure, thus providing high rigidity and lower weight in a very cost effective manner. For the suspension, the job on the front end is done by a WP Upside Down (USD) 43mm fork with 150mm travel and the duty back rear is done by WP monoshock suspension, again having 150mm travel. So, the next question that would come into anybody's mind, as to why a USD fork up front and why a mono-shock back rear and why not go conventional and save on bucks. The standard fork design that we have in our motorcycles is known as Telescopic Forks because it contains the fork tubes which contains the suspensions components like springs, dampers and oil internally to the assembly, and the physical arrangement of the fork tubes represent a conventional telescope with one tube going inside the other for damping operation. Having USD forks instead of conventional forks results in lesser Unsprung Weight, i.e. lesser component mass being supported by the suspension, resulting in more feedback from the suspension due to the contact patch of the road underneath. This as a result greatly enhances the over all handling of the motorcycle. For the rear suspension, the traditional twin shock setup might look like doing the job just fine and in a much cost effective way, but as the saying, evolution is the only constant in nature, and just came the single monoshock rear suspension. The conventional twin damper suspension setup have been very effective and cost effective at the same time, but when we are talking about performance motorcycles like the Duke and above, more is never enough. Conventional suspension setup are prone to fading. 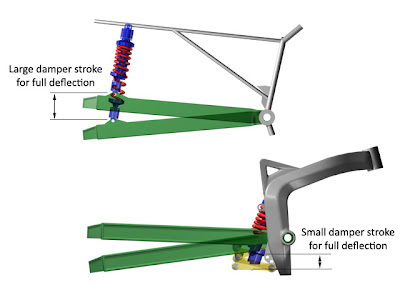 So, as can be seen from the figure above, since the conventional suspension is connected closer to the rear axle, the damping deflection is more, resulting in more fading and lesser feedback from the rear end. On the other hand, with the single monoshok suspension setting, we get the same amount of deflection, but lesser damping deflection, resulting in less fading and more feedback. The WP Monoshock suspension, provides 150mm of travel to provide a combination of comfort and feedback rolled into one package. So, the combined effect trellis frame, front USD suspension and the Mono-Shock rear suspension gives the KTM Duke 200 a very precise handling characteristic, paralleled only by motorcycles belonging to the higher genre. For any fun motorcycle, the throttle is your ticket to entertainment. It's absolutely paramount that there's the sharpest connection between your right wrist and the band inside the mill. It's as much a characteristic of the engine, where the KTM Duke 200's short stroke, close geared engine excells, it also depends on the fuelling, and fuelling is where the Bosch Electronic Fuel Injection system of the Duke 200 shines. Better cold start performance. 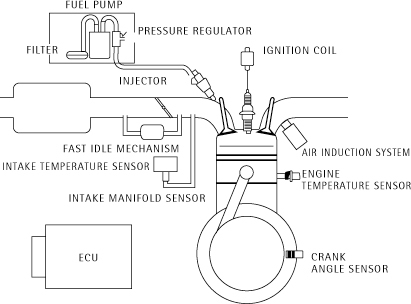 When the engine is cold, the engine is not able to vaporise the fuel and the fuel condenses on the wall of the cylinder, so the Air Fuel mixture becomes lean, leading to de-graded engine performance, so much so that engine is not able to fire up. This loss of active fuel is compensated by the Choke operation. In a Fuel Injected system, this condition is detected by the ECU system, and it automatically adjusts the fuelling to avoid cold start problems. Crisper throttle response. 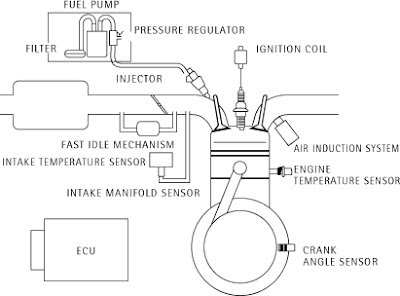 Since the Fuel Injected system determines the fuelling required based on the feedback of various parameters being recieved by the ECU like, engine temparature, ambient temparature, throttle position, crank shaft position, the resultant throttle response is more quick for Fuel Injected vehicles in comparison to carburetted vehicles, where in the Air Fuel mixture is set and does not alter based on riding requirements. What I've tried to explain above, is based on my personal thinking as to what one needs to be understood in order to really appreciate as to what kind of a motorcycle the KTM Duke 200 is and what does the features of the Duke acually mean in the real world. I always believe that you don't own a motorcycle, but you live with a motorcycle, and you won't want to live with a total stranger, would you? I hope that this article helps you to know and understand the Duke 200 better, if not totally. Reading this article after five months of buying a Duke 200. Your writing style is really good. Came across this article five months after buying a Duke 200. Your writing style is commendable. Well informed and in an even tone.